SpaceX announced on Feb. 27, 2017, that it will be sending two people on a free-return trajectory around the Moon in late 2018 using the company’s yet-to-be-flown Crew Dragon (Dragon v2) spacecraft. The announcement came with less than 24 hours notice when the NewSpace company’s CEO and founder Elon Musk tweeted about it. According to a news release from the company, SpaceX was approached by two private citizens for the trip sometime next year. The trajectory will be a “long loop” around the Moon, reaching about 400,000 miles (650,000 kilometers) from Earth with no landing on the surface. The two citizens will fly alone with no professional astronaut with them. SpaceX did not identify the individuals and said they will undergo health and fitness tests, as well as training, later this year. The company said other flight teams have expressed strong interest and it will release more information about them contingent upon their approval and confirmation of the health and fitness tests results. In the press release, SpaceX thanked NASA, for, without the U.S. space agency, the company would not be as far along as they are now. 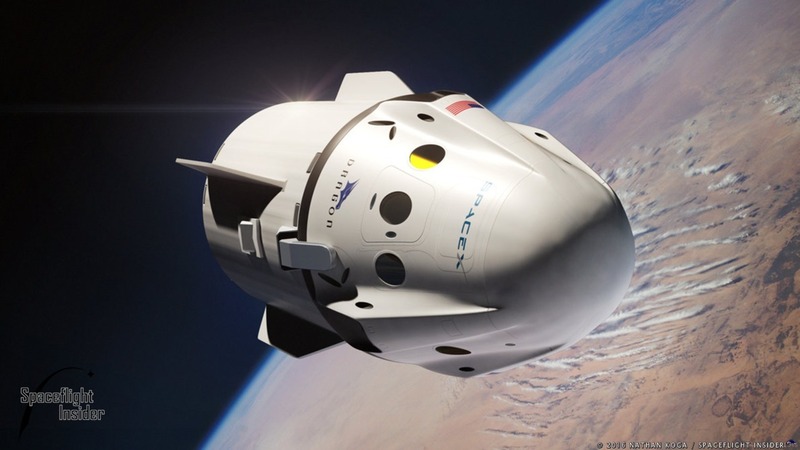 The Commercial Crew Program provided most of the funding for the Crew Dragon’s development. The mission will fly into space atop the also yet-to-be-flown Falcon Heavy rocket. Its debut mission is slated for sometime in Summer 2017. Once it launches successfully, it will be the most powerful vehicle to send payloads into space since the retirement of the Saturn V Moon rocket. SpaceX stated Falcon Heavy will have 5 million pounds of thrust at liftoff, which is two-thirds the thrust of the Saturn V and over double that of the next largest launch vehicle currently in service. If this mission flies on time in late 2018, it is entirely possible SpaceX may beat NASA’s timeline of sending a crew to the Moon, even if a proposed acceleration of crewed flight is ultimately accepted. Musk, however, did not think it would be that big of a deal. “I think what matters is really the advancement of space exploration and exceeding the high water mark that was set in 1969 by the Apollo program and just having a really exciting future,” Musk said. The first test flight of the company’s Crew Dragon is expected to occur later this year. According to NASASpaceflight, the current plan calls for a two-week uncrewed demo flight from Nov. 11 to Nov. 25, 2017. During that period, the spacecraft will rendezvous and dock to the International Space Station’s newly installed International Docking Adapter, which is located on the forward end of the Harmony module. Following that mission, SpaceX will perform a launch abort test sometime in early 2018 before flying the second demo mission of the Crew Dragon. This time it will have astronauts aboard. The current schedule calls for the month-long flight to take place in May 2018. “Once operational Crew Dragon missions are underway for NASA, SpaceX will launch the private mission on a journey to circumnavigate the Moon and return to Earth,” the press release stated. The launch will take place from Kennedy Space Center’s Launch Complex 39A (LC-39A). SpaceX signed a 20-year lease on the complex in 2014. It has since renovated the pad to be able to launch its Falcon 9 and Falcon Heavy rockets. The first flight from the pad took place on Feb. 19, 2017, sending a cargo variant of the company’s Dragon capsule to the space station. LC-39A not only saw the start of dozens of Space Shuttle missions but also nearly all of the Apollo Moon missions as well. 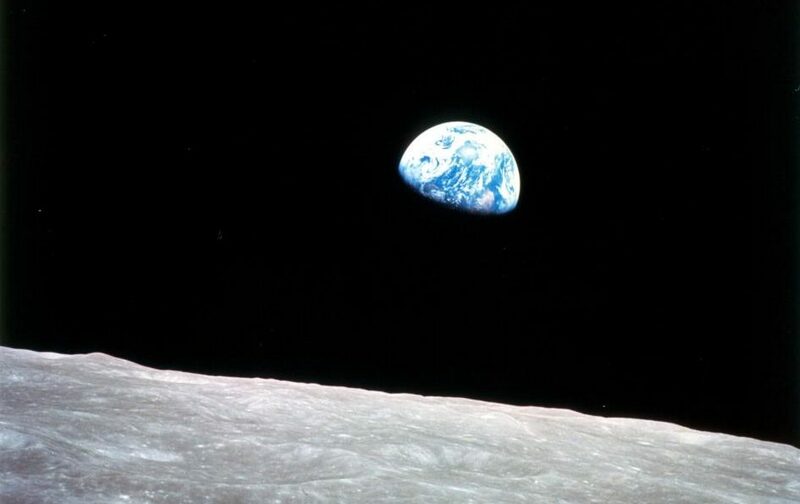 The last flight to go to Earth’s nearest neighbor occurred in December 1972. Since then no human has traveled further away from Earth than a few hundred miles. “This presents an opportunity for humans to return to deep space for the first time in 45 years and they will travel faster and further into the Solar System than any before them,” the press release noted. NASA commends its industry partners for reaching higher. We will work closely with SpaceX to ensure it safely meets the contractual obligations to return the launch of astronauts to U.S. soil and continue to successfully deliver supplies to the International Space Station. For more than a decade, NASA has invested in private industry to develop capabilities for the American people and seed commercial innovation to advance humanity’s future in space. NASA is changing the way it does business through its commercial partnerships to help build a strong American space economy and free the agency to focus on developing the next-generation rocket, spacecraft and systems to go beyond the moon and sustain deep space exploration. The astronauts are lucky the Sun has been unusually quite for quite a while. They are less likely to get hit by a coronal mass ejection while they are traveling to the Moon. I heard somewhere that one of the Apollo missions missed getting hit by about a week. They went on to say that had they been on the Moon when that CME hit, the astronauts would have likely died from the radiation exposure before they would have landed back on Earth. I don’t know if that is true or not. But I would avoid traveling outside the Earth’s magnetic field during the solar maximum. I hope they can transmit good quality video of the Earth & Moon from out there. Sounds to me that SpaceX statements go out of their way to try not to offend NASA. But NASA’s SLS/Orion mess is utterly humiliated by this promise, if it actually will happen. Where’s the Lunar lander, NASA, where’s the lander? They weren’t planning on landing on the moon and until NASA gets funds allocated from congress for a lander they can’t build it. The rather obvious response should be: what are you going to do on the Moon that you need to land? We already proved we can land on the Moon. Do we want more soil samples to study? We have the Apollo lander design for that purpose, just modernize it. OR are we doing things with a goal in mind? What goal? A lunar base from which to do scientific experiments and a platform for commercial activities? Wouldn’t that necessitate a lander with more carrying capacity than a modernized Apollo lander? Is the proper supply of fuel!!!! LOCALFLUFF , What does nasa have to do with this? This is a SpaceX project. What are you talking about landers for? Read the article it’s a lunar orbit mission. I don’t anticipate SpaceX accomplishing this in their expected timeframe. Elon is trying to distract everyone from the fact that Tesla has been crashing and the model 3 has been delayed again. It’s also a ploy to gain influence in space policy and direct more funds from NASA to SpaceX’s pet projects. 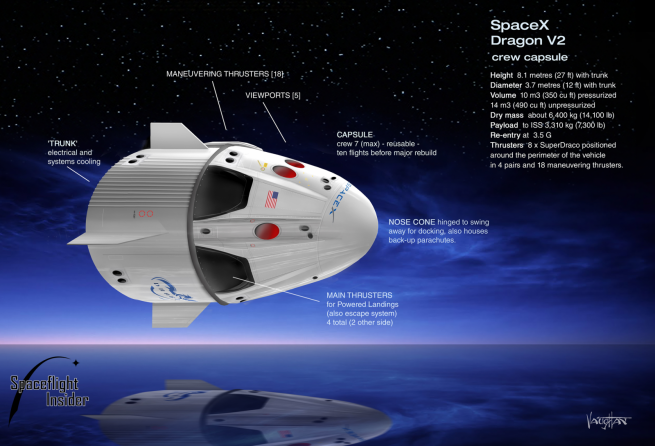 If it’s so commercial, why is NASA having to fund the Dragon? Let Elon put up the dollars and reimburse NASA for the R&D costs, unless SpaceX is jjust another contractor. The Dragon development was paid for by NASA because they needed it. It didn’t give them exlusive use of it. Also the Falcon Heavy was developed by Space X funds. NASA has first call on Dragon2 use. So there is no problem or conflict. A crewed, month long mission, reminds me of what Aldrin and Lovell had to go through. Respect to anyone who undergoes that mission! Actually it is closer to 50 million for a commercial passenger to the ISS. The last seats bought by NASA from Russia were 81.7 million a seat. SpaceX stated that the passengers for the Lunar fly by were a bit more than the russian ISS trip… so 90 – 100 million each. Paying passengers are an excellent way to subsidize SpaceX’s Mars goal. How many wealthy people are willing to shell out $20 million per seat (approx. current round trip cost of Russian seat to ISS) to fly around the moon? I think we would see a backlog of celebrities IF SpaceX actually markets the space tourism ride around the moon. It also serves as a dry run to Mars to shake out the deviling details of a 12 month round trip fly by. While a week in space in a confined space is not a true analog of what will be experienced, we do have the Russian isolation experiment that simulated a Mars fly by. Being able to cater to a rich person for a week will definitely prepare you to handle much longer trips to dedicated astronauts. I could see SpaceX teaming with Bigelow Aerospace to attach an inflatable hab to do these tourism runs as a means to further dry run configurations to Mars in an evolving pay as you go business architecture. SpaceX is a transportation company that is developing a market for it’s service. If you don’t diversify and develop customers, you won’t stay in business. SpaceX would be foolish to depend only on NASA and the ISS business and I believe Elon Musk gets that point. SpaceX is a monument to doing what was commonly accepted as undoable. Elon Musk started his own rocket company when so many others have failed before him. He started his own launch services that successfully compete with national rocket providers. SpaceX has returned first stage rockets and landed them intact. They have upgraded dramatically the capability of their existing launcher time and again when it was said it could not be done. They hold the world record for thrust to weight of a rocket engine. They are about to reuse a first stage launch rocket (the Holy Grail). They provide cargo services to the ISS at the lowest price and with return capability. They have built their own manned space craft on a shoestring budget. They have developed the Rapture full flow, stage combustion, methane rocket engine in record time with private funds with world record combustion chamber pressure and reusability. When Elon Musk says he will send two people to swing around the moon I believe him. I get rapture at the thought.